Kit 1-S fits: Victor and Black & Lamb #1.5, #1.75, #2, Montgomery #1.5 dog on, #3 dogless or dog on, and Northwoods #1.5 and #1.75. Kit 2-S fits: Victor #3 soft catch, #3, Montgomery #2 and #4 dog less or dog on, and Northwood #3. For Bridger Traps, replacement 4-Coil spring. 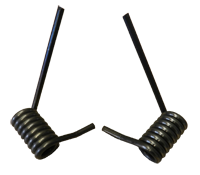 Music wire coilsprings are stronger than most manufacturers coilsprings of the same size and they will last much longer. Strong springs help prevent misses by making the trap faster. They fit most coilspring traps. Highly recommended to power up traps with laminated jaws or rubber padded traps.